Rebecca Necessary will be team-teaching the upcoming Architecture Skills workshop with Paul Hobgood. Participants will learn some of the tricks of the trade, and best methods for drawing and building models. Rebecca is a graduate of NC State University College of Design, where she received a Masters of Architecture. 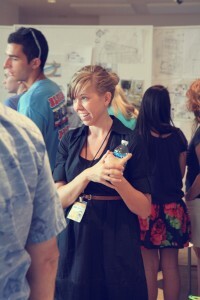 She stays busy working as a project designer and teaches a sophomore studio at NCSU. Rebecca also taught last summer's Spaces and Places week-long Studio. Get the workshop details, and download the registration form here. I am a project designer for a local architecture firm (working towards becoming a licensed architect) and I teach undergraduate architecture studios at NC State. I also take a lot of photographs. How did you get to where you are today (in three sentences or less)? I took the time to figure out what I really wanted to do... what I was truly most passionate about. I then worked really hard, stayed focused, and kept my eyes open. I still have a lot to learn. Young minds are an amazing source of inspiration for me. The enthusiasm they bring to any subject is really refreshing. 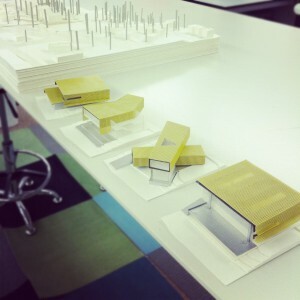 I also love to teach youth what architecture is all about and what we really do as architects. 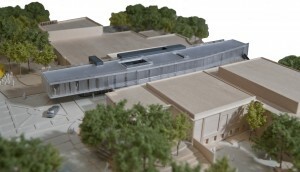 In this workshop, students can expect to learn more about architectural drawings and model making. They will learn what tools we use, the different types of drawings and models we make, and then learn some basic drawing skills, as well as build a model. Wood. I love its versatility, its texture, and the warmth it can provide a space. My house. My husband and I designed and built an addition and extensive renovation to our house here in Raleigh. It's far from perfect, and there are many things I want to change about it, but when I think of all I learned and how much I grew as a designer during the process, I am very proud. It's still in progress (and will likely be in progress forever), but it's definitely the best thing I've made... yet. Anywhere by the sea. The mountains of NC are a close second. It might sound cheesy, but the classics are all hard to beat... Alvar Aalto, Charles and Ray Eames, George Nelson. They all designed objects and furniture that is so timeless and well designed that it is still copied and replicated today. Someone who is still practicing that I admire a lot is John Pawson. Of course then there is Steve Jobs. Plus all the designers behind MUJI. It's too hard to name to just one! Also a tough question to name just one, but I tend to often land on Richard Diebenkorn. I love his choice of color in all his work. The ordered and linear nature of his abstract pieces really appeals to the architect in me, but I also love his landscape and figure pieces for the way they blur the line between abstract and real. His work never gets old to me. Most important thing to remember when desiging/making? Whatever you're making or designing is never really finished... or maybe that's just what I tell myself because I tend to have a hard time finishing anything. Favorite object or tool (and why)? My cameras...fancy, cheap, iphone, all of them. They help me define my view of the world and capture it as I see it. My photos are really an extension of who I am. I take A LOT of photos. Stay tuned for an interview with Rebecca's co-teacher, Paul Hobgood, next week!